If you’ve ever wanted to learn the captivating art of Chinese brush painting, here’s your chance! This convenient, all-inclusive beginner’s kit opens the door to an ancient world of artistic tradition with a full-color project book that is filled with inspiration and ideas. Inside the full-color instruction book, you will learn all about the tools and materials included in the kit and how to use them effectively; then you’ll discover a series of inspiring painting lessons to follow and learn. 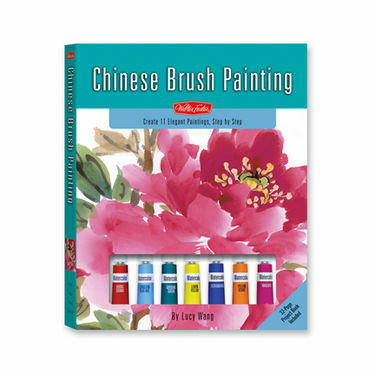 With the help of Lucy Wang’s step-by-step, easy-to-follow instructions, you will be creating your own Chinese brush masterpieces in no time! Hardcover 9" x 11.25" case includes full-color 32-page paperback book, ink stick, ink stone, brush rest, 3 natural-hair Chinese paintbrushes, ceramic water dish, 5 pan watercolors, 6 tube watercolors, and watercolor paper.